Is seaweed the packaging material of the future? Let’s be honest – packaging is a bit of an environmental problem. The UK alone reportedly produces more than 170m tonnes of waste a year. In and among that are materials that take hundreds of years to biodegrade, leak poisons, or never break down at all. As we shop online more and more, and wrap up more and more of our food, the packaging conundrum is only going to continue. But steps are being taken to try and lessen the environmental impact. One area that might make a difference is edible packaging. Primarily being explored for use in packaging food products, edible packaging does what it says on the tin – it can be eaten along with the product it’s protecting, negating the need for extra plastics and cardboards. The front-runner in edible packaging materials is seaweed. It’s naturally high in fibre and vitamins, and can be turned into packaging without the need for chemicals. As seaweed is biodegradable, even if the packaging ends up in landfill or the sea it will break down without any damaging consequences. What’s more, seaweed doesn’t need water, fertilisers or other key resources to grow, and absorbs CO2 as it does. Evoware is one company trialling using seaweed to create a plastic-like packaging that can be safely eaten. The material is being looked at for wrapping for sandwiches, burgers and other snacks, as well as to replace plastic sachets for instant coffee and noodle seasoning. It’s not the only one. 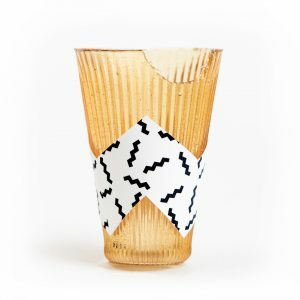 Loliware has been creating edible cups out of seaweed since 2015, but has recently also branched into a seaweed-based alternative to the plastic straw. In the latter’s case, it’s the texture that has been particularly important to get right – the seaweed straws still feel like plastic straws. The bonus is that they can either be eaten along with the drink, or break down in the rubbish. With the US apparently using half a billion plastic straws a day, the Loliware straw could make a big impact. It’s also an interesting example of how edible packaging can enhance the eating experience as the Lolistraw can be flavoured and coloured if desired. As such you could have a fruit flavoured straw with your juice, or vanilla with your iced coffee. Skipping Rocks Lab is hoping to use seaweed to completely rethink one of our most familiar packaging designs – the plastic water bottle. The Ooho! is a seaweed-based, edible, flexible packaging membrane that can be to contain water. The result is a ‘water ball’, which can either be consumed whole or have a hole made in to pour the water out of. The ball even has a peelable outer layer to keep the interior clean and free of germs for consumption. This is a major consideration with edible packaging if the intention is for people to ultimately eat it. The membrane can be used to contain any liquids such as other beverages and cosmetics. Edible packaging hasn’t yet made it to mass manufacturing – Evoware was a winner of the $1 million Circular Design Challenge, Lolistraw and Ooho! are both sourcing crowdfunding. But the potential is there. And that means that designers should be thinking about how they could make use of these new materials now.